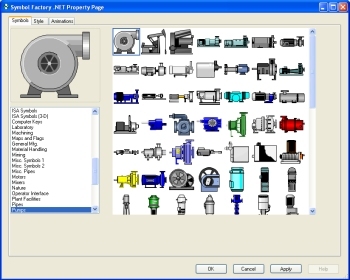 Symbol Factory .NET is a .NET software component used for adding animated objects from a library of over 3,600 industrial and manufacturing objects into your Visual Studio.NET software applications. Symbol Factory .NET is built around .NET Framework 2.0. ->Two.NET 100% managed code User Control components that can be used with your Visual Studio.NET 2010, 2008 or 2005 projects written in VB.NET or C#. After installation, the components automatically appear in your Visual Studio.NET toolbox as shown here. Simply select the component you want and drag it onto your form, right click, and select Symbol Factory.NET properties and away you go. Standard Control - This powerful control is like a chameleon and is the heart of Symbol Factory.NET. You can put as many instances of this control as you want on a form and each one can take on a different appearance and animations. This unique architecture gives you the power of over 3,600 industrial graphics without the overhead of 3,600 unique controls. Incremental memory usage for each instance is tiny, making for efficient applications. Each control instance supports transparency so that you can put them on top of other controls or other .NET objects. Cutaway Control - The cutaway control is a utility control that is intended to help with doing fills or vertical progress indicators. The cutaway can be placed on top of Symbol Factory.NET Standard Control components.